Work is busy, but good. I’ve got a project right now that is for the Board Meeting next month in Michigan. It’s slightly intimidating knowing the Board of Directors is appointed by the President of the U.S. and confirmed by the Senate! My family is coming tomorrow! It’s hard to believe how fast this week is going. 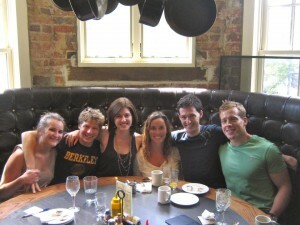 I figured I should post a picture of the friends that I have been referencing in my blog. This pic. was taken this past Sunday at the brunch I mentioned in my last post. Hope everyone has a great day! As always, thanks for reading! Just to let everyone know, I will not be near a computer this weekend. Check back in on Monday though for pics. of the family and I in DC! ← Campus: Summer 2012- What’s it Like?